On the title track of her highly anticipated debut album So Free, singer/songwriter JoAnna Lee makes a personal declaration about following her own path that will inspire anyone who wants to brush off the naysayers and take bold, massive action towards achieving their dreams. With her soulful, dusky voice (that has earned her favorable comparisons to everyone from Grace Potter, Colbie Callait, Susan Tedeschi and Bonnie Raitt ) sharing the urgency of following our hearts, she sings, "The world can be cruel and cold/Don't let it take ahold. . .What will it take for you to finally see the truth. . .the only way to be is so free, free to be who I wanna be. . .You're the one in control/Do what's right for your soul..."
The multi-talented performer's inspiration for "So Free" was the fateful decision she made six years ago that changed her life. She left the small town environs of her longtime home of Bend, Oregon - where she became popular on the coffeehouse and wine bar circuit - and moving to the thriving live music hotbed of Austin to find greater opportunities to share her voice and bare her musical soul to the world. Even in a city where "there is literally music on every corner," JoAnna has carved out a niche and generated an ever growing fan base for her edgy acoustic based pop, rock and soul hybrid vibe via gigs at numerous bars, restaurants and hotspots like historic Memo's and the One-2-One bar. Daring to mix some of her powerful originals into her sets, she literally opened the floodgates for a fresh crop of singer-songwriters at Cedar Street Courtyard during her longtime weekly Saturday night residency. Prior to her booking there, the venue strictly booked cover bands. 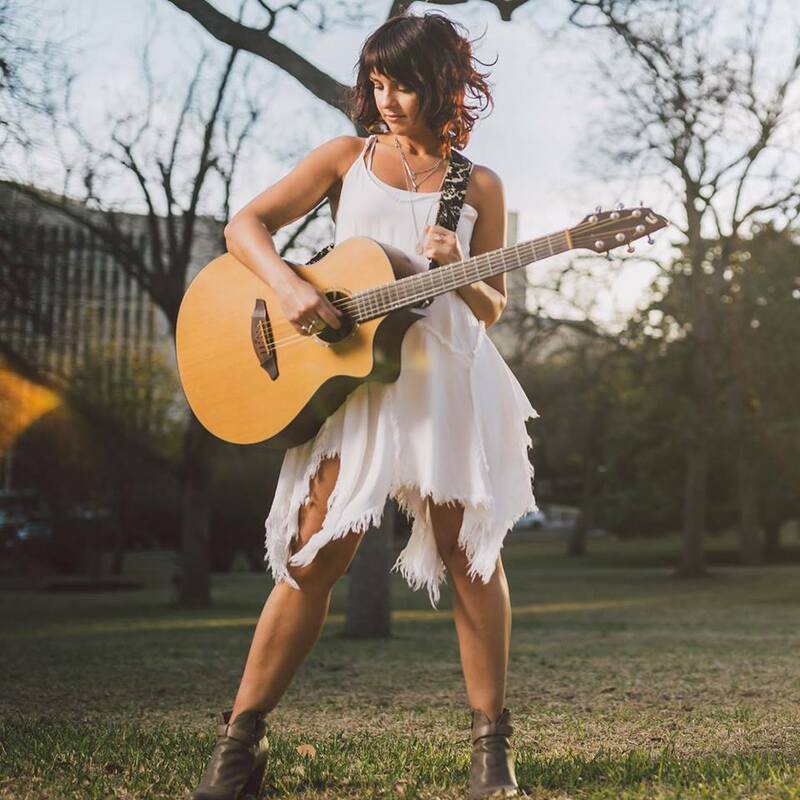 "Moving to Austin was my way of fulfilling the vision I had when I was a little girl about making music full time," says JoAnna, a Northern California native who grew up in Washington State and Oregon singing in church, starting with her first performance at age six, and wrote her first song at 11. "At a time when everyone in Bend, OR was starting to have families and define what their lives would be about, I realized that I hadn't had a chance to go after what I truly felt I was supposed to do. I was driven to go out, experience new things and give myself a shot, and chose Austin after hearing someone talk positively about it. So many singer-songwriters like me go to L.A. and Nashville, but I wanted to be in a place where I might have a better chance to be heard. "My heart had never steered me wrong,: she adds, "so I got in my 1988 Accord with $1000 in my pocket and drove across country to live in a place I had never even visited. It took some adjusting, but once I gave my whole heart to the city, great opportunities came my way and I made some amazing connections. I've been able to grow as a musician and all of these experiences have given me the confidence to emerge now as a solo recording artist." While establishing herself on the Austin club scene, JoAnna connected via a mutual producer friend to Les Cutmore, Founder and President of Cutmore Entertainment, Cutmore encouraged JoAnna's developing artistry and songwriting and signed her to his triple-A label Cutmore Records, He hooked her up with several producers including platinum selling producer Dwight Baker, who brought JoAnna's vibe to the next level in the studio. JoAnna went on to completely re-recording and producing songs she had recorded in the past while pursuing earlier endeavors. I now realize that some of the older recordings were overproduced," she says. "We re-recorded a lot of the material to make it rawer. Sonically, the tracks on So Free fall somewhere in between my solo acoustic live sound and the previous recordings - with cool rootsy textures in all the right spots." JoAnna brings a unique array of influences to her rootsy soul sound. When all her friends in grade school were getting into N'SYNC and Britney Spears, her mother was introducing her to Stevie Wonder. Surrounded by a family full of cousins who all played instruments, she took naturally to incorporating R&B (her original dream was to be a Motown singer) with her acoustic guitar. From the dreamy, lilting "Sunshine" (which she originally wrote about a crush she had for an eighth grade talent show!) to the raspy obsessional-confessional "Drinking By Myself," the ten tracks on So Free create an intimate yet universally relatable chronicle of her life experiences, covering a span from adolescence through young adulthood, reflecting joy and optimism, innocence and growth, and heartbreak tempered by lessons learned. Along the way, JoAnna writes emotionally compelling songs about longing ("Cuddy Buddy"), the difficulty of letting go ("Always on My Mind"), being a hopeless romantic ("The Real Thing"), and having enough self-respect to craft the perfect response to a casual come-on: "Who Do You Think I Am." While she originally wrote the wistful vocal and guitar piece "Forever in My Heart" for her high school graduation, it's also the perfect coda to So Free. She sees the song as a way of wishing a fond farewell to the years reflected on the album's songs while welcoming the next phase of life and the more mature topics that are inspiring the songs for her next project. "Including 'Forever in My Heart' on the album was a way to say goodbye to the person I was who wrote all these songs while saying I will be back soon with more," says JoAnna. "So Free is my way of telling a story about new experiences involving young love, the innocence of life, and reminding myself that no matter how my eyes get shadowed by the harsher realities in the world, there's still a young girl inside who loved to write simple and sweet things about love. This album will forever be my moment of capturing that optimism and love of life and experiencing friendships and romance for the first time. Because no matter what, I remain a hopeless romantic."